The Family and Consumer Sciences Department offers a tremendous opportunity for all students to explore career options. 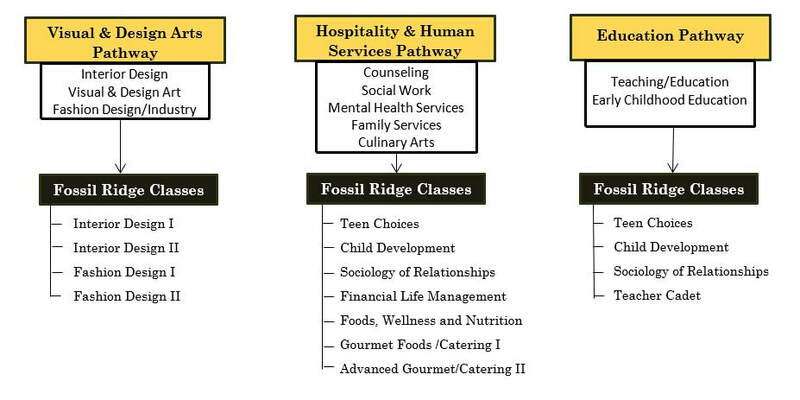 The following classes are recommended to help develop a background to pursue careers in the following Family and Consumer Sciences pathways. Unless you plan to live at home the rest of your life this class is for you. Everything you need to know about living on your own from finding a job and researching your career options to moving out and cooking for yourself. Living on your own means learning how to manage your money. Our Finance unit will focus on banking, budgeting, credit and investing for the future. End the semester learning how to be a smart consumer including basic cooking skills to help you save money and eat healthy. This course meets the PSD graduation requirement for Personal Financial Literacy. Do you like children? Are you interested in a career working with children? If you answered ―yes, then this is for you! This course focuses on knowledge and skills related to the development, care, guidance, and protection of children. Instruction addresses the principles of promoting the physical, emotional, social, and intellectual development of children. Other topics include parenting rights and responsibilities, pregnancy, and prenatal care and development. This class is also a great foundation for students interested in psychology, sociology and human development. "Interested in teaching as a possible profession? Interested in the role education plays in society? If so, this is the class for you! Students in this class will be involved in a fast paced innovative hands-on curriculum where they gain knowledge about teaching and learning. Teacher Cadets will develop and master skills that will be helpful in college and beyond, such as presentation, public speaking, writing, communication and reasoning. This is a course with college credit options. Each student will make a difference with children as they are able to ""try out"" teaching in a ""mini-teaching"" experience." At FRHS: This course may be offered alternating years, depending on enrollment. It is currently being offered for 2018-19. Dating? Marriage? Relationships with parents? This course is about all these things and more. You will explore your personal attitudes, goals, and values. This class will help you seek positive relationships with others, improve the quality of your relationships, and help you make better choices leading toward a more fulfilling life. Emphasis will be placed on studying those relationships that involve emotional, psychological, or physical closeness. Being educated on these issues will increase your tolerance for people whose decisions and lifestyles are different from your own. Relationships are often the most important aspects of our lives, learn how to develop yours! Are you passionate about design and home décor? Do you re-arrange your furniture regularly? Ever dream about designing for HGTV? This course will introduce you to the profession of Interior Design in a hands on environment. You will learn the elements and principles of design within the context of residential interiors. Learn to design personal spaces with flair and manage client relationships. Time to start designing! There is a lab fee for this course*. Do you find yourself admiring the design of your favorite café as you sit and enjoy your cup of coffee? Are you intrigued by the elaborate architecture and décor inside hotels as you travel? This course is a hands-on class that allows you to apply your knowledge of Interior Design in a Commercial setting. You will take the skills of working with clients from Interior Design I and learn how to design for all of the customers and clients that will use the space. There is a lab fee for this course*. Is Paris calling you? Do you have a flair for fashion? Join us in the study of the world of fashion.Topics will include: history of fashion; fashion trends; textile selection; and construction. You will be encouraged to challenge your sewing knowledge and creativity with an assortment of projects related to fashion. By the end of this class you will have the skills to further develop your passion for fashion. There is a lab fee for this course*. So you have conquered Paris and you are now ready for the world of fashion! This class is for you. We will utilize all the skills you learned in Fashion I and take it up a notch or two. We will learn more in depth construction techniques, spend more time with design, explore the world of fashion merchandising, go green and learn how to take your own design from the drawing board into your favorite retail store. Time will be spent researching and exploring career opportunities in the fashion industry. There is a lab fee for this course*.